When Toni, Marsha, Jeannie and Terry were on their way home from a girl’s trip, they talked about what they could do together to help others. Their children were now grown and they wanted to use their time to do something fulfilling. After much discussion, they came up with an idea that led them to Ronald McDonald House Morgantown. 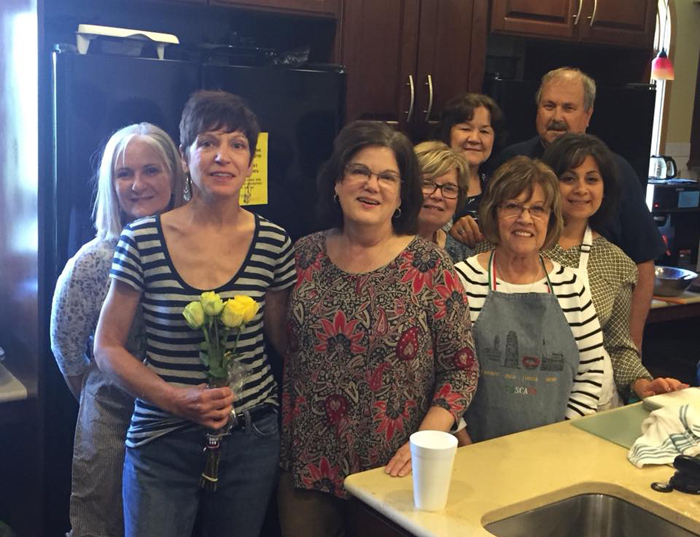 For three years now, this group has been coming to RMH Morgantown on the second and fourth Tuesdays of the month to prepare dinner for the families who stay there. They are known to everyone around the House as Apron Angels. “I still remember serving that first meal, we smiled the whole way home. It was so rewarding,” said Toni. Since then, the original group of four has grown. Other family and friends have joined them in helping make the home-cooked meals. It takes the group 3.5 hours to prepare each buffet style meal. Their menu is always different and includes a variety of meats, side dishes and desserts. In addition to preparing a hot dinner, they also prepare ready-to-cook meals which include soups and crockpot recipes to be heated up for enjoyment when there are no scheduled volunteer meal groups. Throughout their experience, Apron Angels has enjoyed getting to know so many of the families they have been cooking for. “You think you are doing something for someone else and in turn, they are doing something for you,” Marsha said. Each year more than 800 meals are prepared through the Meals from the Heart Program at both RMH Pittsburgh and RMH Morgantown. Individuals and volunteer groups just like Apron Angels donate their time to give our families a chance to dine and unwind so that they can be refreshed for their child in the hospital, without the worry of having to prepare a meal themselves. If you would like to get involved with the Meals from the Heart Program at either RMH Pittsburgh or RMH Morgantown, please click Meal Programs.